As any woman who is getting dressed for the office knows, pulling clothes from your closet that are both chic and acceptable for a day of meetings isn't always intuitive. You want to feel confident and professional without sacrificing your personal sense of style. Interested to find out the outfits stylish women swear by to look both chic and ready for the office, we tapped three fashion industry insiders for their go-to outfit formulas. 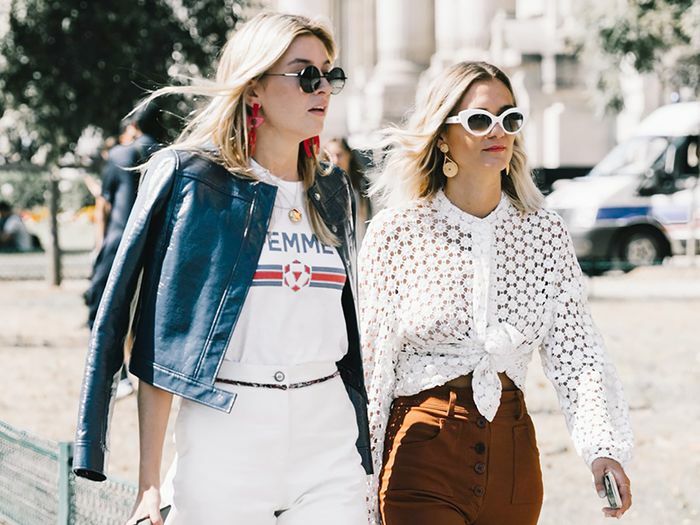 Ahead, Moda Operandi merchandising manager Elizabeth Leventhal, Net-a-Porter Retail Fashion Director Lisa Aiken, creative consultant and street style star Rachael Wang, and fashion designer Laura Vassar share looks worth replicating. Their outfits strike the perfect balance between fashion-forward and work-appropriate. Not only will you discover looks that are ready to be re-created for your next day at the office, but you will also see some of this season's most covetable items for your wardrobe. Keep reading to see what business casual looks like today, and shop the outfits of these stylish women. "Because I work in a creative industry, dressing for the office is slightly more understated and pared back. There are very few 'rules' as to what I can wear to work. In order to feel confident in a business environment, I need to be comfortable, so part of my outfit almost always includes denim. I'll most likely pair it with a vintage tee and sharp blazer, paying homage to the original power-dressing staple. I like to add the unexpected to whatever I'm wearing, something that makes a look 100% mine. It can be something as simple as mismatching my personal jewelry or adding a masculine watch to an otherwise feminine look. I am fortunate enough to be able to wear denim to work, so I always make sure to incorporate one element that elevates my outfit. For example, I'll style my high-rise jeans with a gorgeous silk blouse, a heritage blazer, or a stiletto heel." The checked blazer is one of the season's biggest trends. The go-to jeans for fashion girls. A modern take on classic pumps. "Dressing for the office now also means 'dressing up' as a new mom! I have found that you can't go wrong with great denim (thank you, Re/Done!) and a pair of fun earrings." A romantic, sculptural style that pairs perfectly with jeans. Finished with an ultra-high waist. This style also comes in luxe brown lizard. These "kiss" earrings are designed to resemble lips. This tote can fit everything you need from 9 to 5. "Because I don't go to an office per se every day, my wardrobe requirements are much more flexible than others'. However, on a day of important meetings when I want to come across as polished and professional, my go-tos are a long-sleeve midi dress and pumps, or an oversized men's inspired button-down, a midi skirt, some statement earrings, and a cool mule." Wear this over the summer with mules or in the fall with boots. These versatile mules work with everything from dresses to jeans. "I always look at my day before getting dressed for the office. If we have a fitting day, I am in Brock denim, flats, and a crisp white button-down or cozy knit. Other days, I like to have fun with my outfit and will wear a floral sundress, or skirt and blouse. I always like to mix it up." Wear this with everything from denim to leather pants. The perfect cut of vintage-inspired denim. The perfect pop of color for a streamlined look. This bag is cool girl–approved. Gigi Hadid, Rita Ora, and Kate Hudson are also fans. Go on to shop more office essentials. A modern spin on a sweater. The comfortable block heel makes these perfect for work. We love the puffy sleeves and button details. Add in an interesting print. The It earrings of the season. Add some color to your work look. Trade out your regular trousers for a vinyl version.